A psychological analysis of problems in powerpoint presentations. 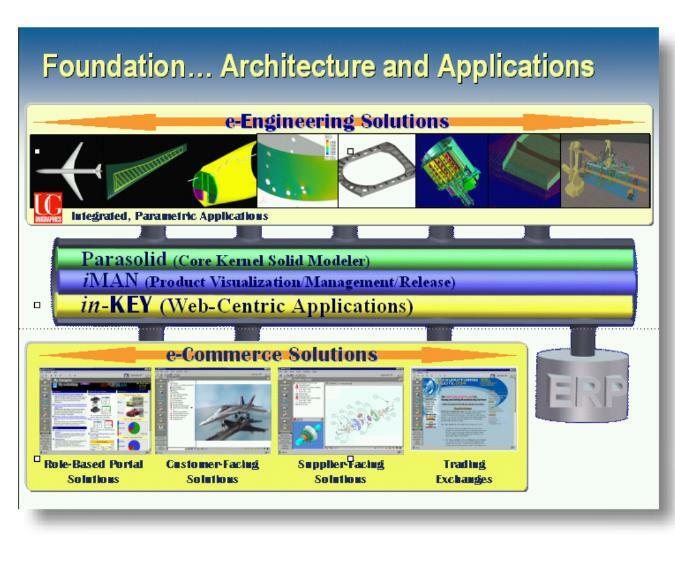 A God-awful powerpoint slide I found on the web. Don’t do this. Ever. Powerpoint (or I guess Keynote, if you’re super-cool) presentations – love ’em or loathe ’em, they have become an integral part of the academic and business world. I can’t really imagine doing a lecture or talk without using powerpoint in at least some small way these days. However there’s nothing worse than a bad powerpoint presentation – we’ve all seen them. The colours are garish and clashing, the text is illegible, the organisation is incoherent, and the illustrations are irrelevant or actively misleading. How can we avoid these mistakes in our own presentations, and ensure that we craft a well-structured, pleasant-looking presentation which will add to the impact of what we say, rather than detract from it? A quick Google of ‘how to make a great powerpoint‘ brings up 144 million pages (including, interestingly, one from Microsoft itself), many of which contain conflicting information (I assume they do anyway, I haven’t read them all). Fear not though, gentle reader; the inimitable Stephen Kosslyn (and colleagues) of Stanford University has just published a paper with the intriguing title of “PowerPoint® presentation flaws and failures: a psychological analysis” in which the common flaws in presentations are deconstructed with an eye to the psychological principles of effective communication. This is great, because it not only points out what’s often wrong with slides, it give some clue as to why these things are wrong. You can read the paper here (free HTML full text – yay!) or download a PDF from the link on the top right. …and it’s proposed that optimising presentations in terms of these cognitive principles will produce greater engagement, understanding and retention of the material, by the audience. The authors then followed up this fairly abstract classification with a series of three studies; rating real-world slideshows from various domains (academic, business, governmental) on sub-units of these eight features, showing that flaws are noticeable and annoying to the audience, but also that people often have difficulty identifying the exact flaw in a given slide. The results suggest that adherence to good practice when designing slides is important, but that a lot of people’s intuitions about what makes a good powerpoint are themselves flawed. Some people may have an ‘eye’ for good, clean design, whereas others might not be able to avoid making some obvious mistakes. I won’t repeat any more of the papers results here, but I urge anyone who relies on powerpoint to go and read the paper and assimilate its findings into their next presentation. PS. Another excellent write-up of this paper is here. The Tobii mobile eye-tracking system. Awesome. The other day I was lucky enough to be able to help out with a bit of data-collection in a well-known London department store, being run by the magnificent Tim Holmes of Acuity Intelligence. This meant that I got to examine some seriously cool bits of new hardware – and new gadgets (especially scientific ones) are basically my kryptonite, so it was generally pretty exciting. The first thing we used was a mobile eye-tracking system designed and built by Tobii. These have two cameras in – one front-facing to record video of what the participant is looking at, and another infra-red camera to record the participant’s exact eye-position. They can also capture sound in real-time too, and record the eye-tracking data at 30Hz. The system comes with a clip-on box where the data is actually recorded (in the background of the picture on the right) and which is also used for the (fairly brief and painless) initial calibration. It seems like a really great system – the glasses are very light, comfortable and unobtrusive – and could have a really broad range of applications for research, both scientific and marketing-related. 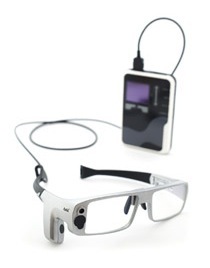 Pivothead ‘Durango’ HD video-recording glasses. Double awesome. These are glasses with a camera lens in the centre of the frame (between the eye-lenses) which can record full high-definition video – full 1080p at 30 fps, using an 8Mp sensor. Amazing! They have an 8GB onboard memory which is good for about an hour of recording time, and also have a couple of discreet buttons on the top of the right arm which can be used for taking still pictures in 5-picture burst or 6-picture time-lapse mode. They’re made by a company called Pivothead, and seem to be more intended for casual/recreational/sports use rather than as a research technology (hence the ‘cool’ styling). They’re a reasonably bulky pair of specs, but very light and comfortable, and I don’t think you’d attract much attention filming with them. It’s worth checking out the videos page at their website for examples of what they can do. They’re also only $349 – a lot for a pair of sunglasses, but if you can think of a good use for them, that seems like a snip. If you’re in the UK, they’re also available direct from the Acuity Intelligence website for £299, inc. VAT. I wonder how long it’ll be before they start showing up in law-enforcement/military situations? The Affectiva mobile, wrist-worn, bluetooth GSR sensor. Triple awesome. This is a ‘Q-Sensor’, made by a company called Affectiva and is about the size of an averagely chunky wristwatch. It has two little dry-contact electrodes on the back which make contact with the skin on the underside of the wrist, and also contains a 3-axis accelerometer and a temperature sensor. This little baby claims to be able to log skin conductance data (plus data from the other sensors) for 24 hours straight on a single charge, and will even stream the data ‘live’ via Bluetooth to a connected system for on-the-fly analysis. It seems like Affectiva are mainly pitching it as a market research tool, but I can think of a few good ‘proper’ research ideas that this would enable as well. This is seriously cool technology. That’s all folks – TTFN. I’ve just come across a fantastic-looking 3-day course running at the University of Nottingham called ‘Matlab for Psychologists‘. The curriculum looks like it starts from the very basics at the beginning of the course, and works up to some fairly advanced material by the end of the three days. The summer course has just finished, but there’s another one due to run in September. Without a doubt, if you’re a PhD student or post-doc at the beginning of your research career, learning Matlab is certainly one of the most useful things you could possibly learn. You can use it for… well… everything really, since it’s a true, general-purpose programming language, albeit wrapped up in a semi-friendly GUI. Presenting stimuli with the psychophysics toolbox is one really popular usage in psychology research, as is general statistical analysis and plotting, and of course analysing fMRI data with the mighty SPM. If I was a PhD student I’d be begging my supervisor and/or department for the £375 to pay for this course – it’s likely to be some of the best money you’ll ever spend on your education. The course is run by Antonia Hamilton of Nottingham University, and she also has some really good Matlab resources on her website here. One other thing – while googling ‘Matlab for Psychologists’ I also came across this book with the same title, which was just published a few months ago. Not a whole-hearted recommendation as I haven’t read it, but it looks like it might be worth checking out if you’re keen to give Matlab a try and can’t get to the course.